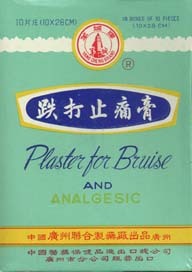 "Damp Injury Stop Pain Plaster"
Plaster-adhesive for "rheumatic" pains due to Wind-Damp or trauma. Promotes circulations of Qi and Blood. Commonly used for sprains, strains, contusions, and arthritis. The small size of these plaster limits their usefulness to wrists, ankles, thumbs, and specific areas of the knee or shoulder, but they are very convenient to leave on overnight or wear under your clothes during the day. Clean affected area with soap and water. Peel the plaster off its plastic backing and place it on the affected area, using as many plasters as necessary for coverage. Can leave for 12-24 hours. Contains caryophyllum flower, camphor oil, wintergreen oil, styrax resin, menthol crystal, borneol crystal. 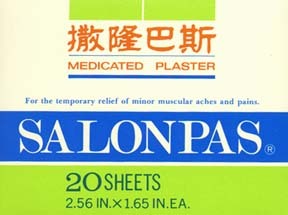 This is a Japanese manufactured plaster adhesive used for minor relief of pain, especially for pain due to sprains and arthritis, but also for muscular pain and stiffness. Its ingredients promote the circulation of Qi and Blood, and are slightly cooling in nature. Contains methyl salicylate, menthol, camphor, glycol salicylate, thymol, tocopherol acetate. "Traumatic Injury Stop Pain Plaster"
Another "medicated" plaster-adhesive applied externally to promote circulation of Blood, stimulate healing and stop pain. Use for acute bruises, sprains, fractures, and traumatic swelling. Also efficacious in muscle strain, neuralgia, and musculoskeletal pain due to Wind (rheumatism). This is a nice plaster because of its large size, and the fact that it contain some of the same healing herbs found in dit da jiao formulations. Contains menthols crystals, mylabris, dragon blood resin, dragon tooth, carthamus flower, wintergreen oil, rhubarb root, taraxacum, acacia resin, myrrh resin, drynaria root, dipsacus root. This is a large ball of herbs, ground up, and bound together by honey. The formulations is designed to invigorate Blood circulation, break up Blood swelling and stagnation, reduce heat, and promote healing. Use for acute bruises, sprains, and swellings due to trauma. Also suitable for swelling and bruising in chronic traumatic conditions. Popular in China for injuries due to sports and martial arts training. Commonly chewed and swallowed, or dissolved in hot water. Commonly used for travel, is is convenient to carry, and if necessary to used externally, dissolve in rice wine or alcohol and rub into the affected area. These pills were originally derived from bear gallbladder, but the pills most likely contain pig gall bladder. Bear gallbladder is reserved for those who can afford it. The hunting of bears for their paws and gallbladders is a common cause of poaching around the world today and should not be supported. Contains angelica dang gui, rhubarb rhizome, inula root, curcuma root, amomum fruit, carthamus flower, pseudoginseng root, "mammalian" gallbladder. This secret formula is said to stop bleeding, disperse stagnant Blood, tonify and invigorate Blood, and stop pain. Used as a valuable first aid remedy for internal and external bleeding, traumatic swelling, and insect bites. Commonly used as a tea for excessive menstrual bleeding, severe menstrual cramps, ulcer bleeding, and hot skin infections. Can be taken internally or applied externally. In cases of serious wounds or bleeding, take the single red pill that comes with each bottle first, with wine. 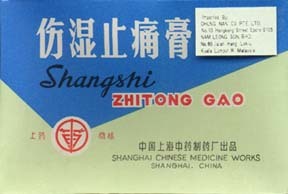 This "medicine" could hardly be obtained during the Viet Nam War, because China was the main supplier of military goods to the North Vietnamese, including Yunnan Paiyao, and every soldier carried it with them to use for gunshot and shrapnal wounds. Contains pseudoginseng root (sanqi), and other "secret" ingredients.